All of the images on this website are photomicrographs (photographs taken through a microscope) of an actual print. The magnification of the microscope was set at 30x, but depending on the size of the monitor that you are using to view this website, the images may vary in size. For that reason, an integrated scale gives much more accurate information on the size of the photographed area of the actual print than a magnification factor. The 1 mm scale bar in every image indicates that the length of that little grey bar is precisely 1 mm on the actual print. 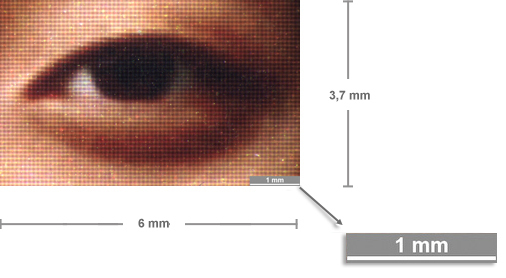 So if you imagine that the pupil of this eye is just over 1 mm wide, and that the whole area shown is 3.7 x 6 mm in size, you have a good idea of the magnification of these images.